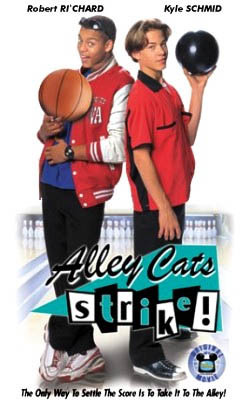 Alley Cats Strike is a Disney Channel Original Movie. It premiered on March 18, 2000. A junior high school basketball game between the cities of East Appleton and West Appleton ends in a tie. The two cities, both vying for a trophy known as The Mighty Apple, must determine the winner through a tie-breaking bowling competition. Alex Thompson and his friends, Delia, Elisa and Ken, are in West Appleton Junior High School's bowling club; they discover that Todd McLemore, a popular basketball player, is also a member of the club, as his friends Leo and Flip had signed him up as a prank. At a bowling alley operated by Alex's father, Kevin Thompson, Todd reluctantly trains for the upcoming bowling competition with Alex and his misfit friends. Todd, who initially is a poor bowler, criticizes Alex and his friends for not demonstrating a strong willingness to win, which they deem as overconfidence. Alex later attends a party with Todd, rather than train at the bowling alley with his friends, upsetting them. Todd's bowling improves, while Alex's bowling becomes worse as he continues to spend time with Todd. The children later redecorate Kevin's struggling bowling alley to bring in customers. Todd uses his popularity to convince various businesses to donate supplies such as paint and flashing lights for the bowling alley, where a party known as the "Bowling Ball" is held and attended by dozens of people. Delia, Elisa, and Ken leave the party early, as they feel betrayed by Alex now frequently hanging out with Todd and his friends. After the party, Alex overhears Todd's friends talking among each other and discovers that they are only pretending to be friends with Alex to increase the chances of their school winning back The Mighty Apple. Jeff McLemore, Todd's father and the mayor of West Appleton, makes a wager with mayor Hanburger of East Appleton: the winning team, in addition to receiving The Mighty Apple, will also get to choose the name for a new school that is under construction. Hanburger hires Whipsaw McGraw, a bowling champion, to train his bowling team. From the city, the West Appleton bowling team receives low-quality team shirts for the bowling competition. The team is also told about the wager between the mayors, after which Alex quits the team out of anger. Todd attempts to convince Alex to rejoin the bowling team, and reveals new shirts with the team's name, Alley Cats, on it. Kevin later tells Alex that he used to be friends with Jeff when they were younger, but ended their friendship after accusing the other of losing a baseball game, which they both believe resulted in the city losing The Mighty Apple. Kevin tells Alex to not let a dispute end a friendship. Alex rejoins the bowling team for the competition the next day. At the end of the competition, Todd's bowling results in a 7-10 split, which he could never master during his training. Delia substitutes for Todd. Using her advanced knowledge of physics, Delia slowly rolls the bowling ball down the lane and wins the competition, to everyone's surprise. Todd tells his father that it does not seem fair for a school to be named over a game of bowling. Alex and his friends decide to compromise and name the new school Appleton Central. Evan Noble - Leonardo "Leo"
Phillip Williams - Louis "Sweet Lou"
Filming of Alley Cats Strike began on October 25, 1999. In 2014, the movie's English Wikipedia article gained attention for having the longest film plot summary on the English language version of the site. ^ Hettrick, Scott (October 20, 1999). "Disney Channel rolls a 'Strike'". The Hollywood Reporter. ^ Blatt, Ben (26 June 2014). "The Longest Movie Plot Summary on Wikipedia". Slate. Retrieved 30 June 2014. ^ Blatt, Ben (30 June 2014). "The Screenwriter of Alley Cats Strike on Inspiring the Longest Plot Summary on Wikipedia". Slate. Retrieved 30 June 2014. This page was last edited on 23 March 2019, at 18:50 (UTC).